Republican lawmakers want to reduce the Court of Appeals and nothing’s going to stand in their way — not even their own inaccuracies. House Bill 239 was debated at a Senate judiciary committee meeting Wednesday. 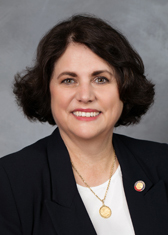 Rep. Sarah Stevens, one of the bill sponsors, told committee members that in addition to reducing the court from 15 to 12 judges, it would also decrease the workload and add to the state Supreme Court’s workload. She said she did not ask Chief Justice Mark Martin for an official stance on the bill, but she said he told her the state’s highest court could take on the bigger workload — almost 1,000 cases per year, according to Stevens. Democrats were skeptical of her numbers, and Court of Appeals Judge Donna Stroud presented an entirely different set of numbers to Senators at the meeting during the public comments. An NC Policy Watch public records request also found that Stevens’ numbers were wrong. HB239 would take so-called “3.1 appeals” (which involve juveniles and termination of parental rights), business appeals and class action appeals from the Court of Appeals and reroute them to the state Supreme Court. Those totals were even smaller in years prior to 2016. In 2015, the court heard 176 of those type of cases; 181 in 2014; 161 in 2013; and 178 in 2012. The Court of Appeals heard 1,339 total appeals in 2016 — the 221 cases that would have been rerouted to the Supreme Court under HB239 makes up only 16.5 percent of the courts appeals workload. And those numbers don’t even include motions, petitions and en banc requests the judges have to take up. The Court of Appeals works in three-judge panels, so reducing it by three judges reduces the panels from 5 to 4, which increases the workload by 20 percent. If HB239 reroutes only 16.5 percent of the court’s appeals to another court, what happens the the other 3.5 percent of cases? There aren’t any clear answers, but experts and former judges have predicted that HB239 will likely lead to delays in appeals and dispositions. the last three years “by about 500 cases per year.” That is also incorrect, according to statistics from the court. There was a decrease in 2016 from 2015 by 78 appeals and 32 petitions. The rest of the court’s workload increased by 251 motions, 324 appeal disposals (with an increase of 347 written opinions) and 343 petition and motion disposals, according to the court. You can see the complete workload of the court from 2006 to March of this year here. 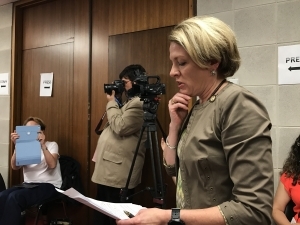 Stroud, who is registered to vote as a Republican, said she was concerned about the disparity between the statistics she brought to the meeting (which NC Policy Watch did not get to compare to numbers from the court) and the statistics Stevens presented at the meeting. She did not take a stance on the bill, noting after the hearing that the judiciary has to remain independent of the legislative work, but asked Senators to consider the disposition time that might be affected by the bill. She said that in 2000, when the court was expanded, there was an incredible backlog of cases and it took about a year to get a disposition on an appeal. It’s now about 180 days, she added.